“Beautiful but a tad over-written”, joked my Mom when in awe, I read the passage out loud. But after a few glasses of wine and the appearance of thunderheads in the backyard, The National’s new album, Sleep Well Beast, and its gloomy opulence, fit the grooves of our night. The National can either be crushingly depressing or wholly inspirational. Either way, it’s undeniable that Matt Berlinger’s voice is a magnetic force, a polarizing crack that goes straight to the source. It’s the first day of fall. Not technically, but last night a crisp air flooded NYC and turned the leaves in Queens. From the Ridgewood M station platform, the flat roofs give way to the treetops in Highland Park. Usually, I’ll throw on the headphones and avoid shifting eyes for the 48-minute commute into the city. Today, I actually see the other passengers: a boy running a toy truck along the window, a quiet woman juggling papers, coffee, and a cell phone, a brace-faced teen laughing with her friend while studying for a test. Between the weather, the view, the unusually serene train ride, and the following song, my mind saves this memory as the mark of a new season. George Fitzgerald’s debut album, Fading Love, is careering and moody. While the sound and temperament of the songs are consistent, many of the tracks are instrumental, which places the album in the choppy waters of the soundtrack genre. Some movies have memorable soundtracks, where a particular song or suite of songs, evoke acute memories for a specific film and the time(s) and place(s) we watched them. Drive, The Darjeeling Limited and Pat Garrett & Billy The Kid, come to mind for that reason. Yet, removed from their original contexts, movie soundtracks become adaptable, translated as the background music for deep concentration or travel. No doubt, Fading Love has many of those qualities. The lead single, “Full Circle (feat. Boxed In), is a well-balanced, mid-tempo, blend of synthesizer pops and drumming over which a skulking voice broods about heartbreak. Maybe someone should cast it in the next sci-fi love story à la Her or Ex Machina. Like many of Fitzgerald’s songs, “The Waiting” is driven by a scaling melody, that is, neither complicated nor over-produced. Not quite as pop-sensitive as Disclosure or as overwhelming as Caribou, George Fitzgerald has created a more somnambulistic sound. Though I’m unsure whether it’s the stuff of summer festivals, his songs should be a presence on your Deep Cuts playlist. My buddy Sam was dead on. The guy at the turntables did not sound like Bonobo. Before arriving at 60th 6th street, I had always thought of Bonobo’s albums as background noise when studying for finals. His music was slow and meditative. The perfect soundtrack for deep contemplation and an anecdote for too much coffee. But the guy standing in front of the black and white knobs, beneath a light that looked like an open tanning booth, didn’t sound like slow, contemplative Bonobo. Instead, his beats were electric, sound waves bouncing off the concrete walls like sonar. The crowd responded with its own electric energy. 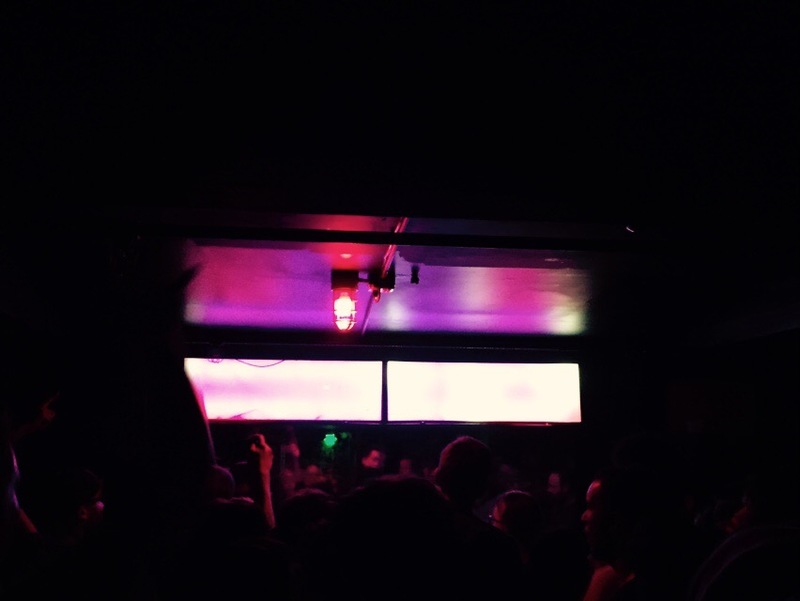 Probably because the dank basement felt less like a SF bar and more like a scene out of Fight Club – sweaty t-shirts flailed and heaters lit up the crowd. I had planned on taking videos at the show, but it became clear from the start that my phone belonged in my pocket.